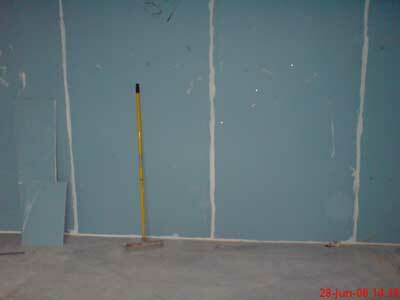 The first layer of plasterboard goes up. There will be three layers altogether. Each layer will be aligned so that the joins do not match. 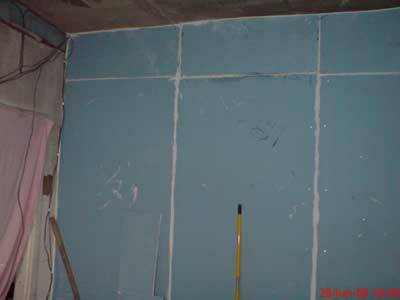 All joins in each layer are then sealed with acoustic sealant. Between each layer I have used “Green Glue” to help dampen the vibrations. Two tubes of “Green Glue” is used on each 8’x4′ sheet. I also made sure that no direct coupling is made from the front sheet to the timbers. Each sheet is screwed only to the sheet behind using 20mm screws. The acoustic sealant is used all around the edges as well in order that there is no direct coupling to the side walls, the ceiling, or the floor. The cables are sealed into the board using plenty of sealant.